After putting in my brand new Itea virginica 'Sprich' Little Henry® Sweetspire that I got through the mail, the plants look to be doing well, putting on a tiny bit of new growth, a couple lower leaves drying up - but the overall look is that the leaves are turning color. Kinda blotchy, more reddish, not that bright lime green like when they arrived. The stems are also redder than I thought they should be. So what's up with that? I'm not even sure what chlorosis is, but I gather that it is "a condition in which leaves produce insufficient chlorophyll" (Wikipedia) because of some type of environmental strain. I read that Itea virginica like more acidic soil, and I've never tested my soil or tested the pH in my new backyard bed. I guess it could be chlorosis? 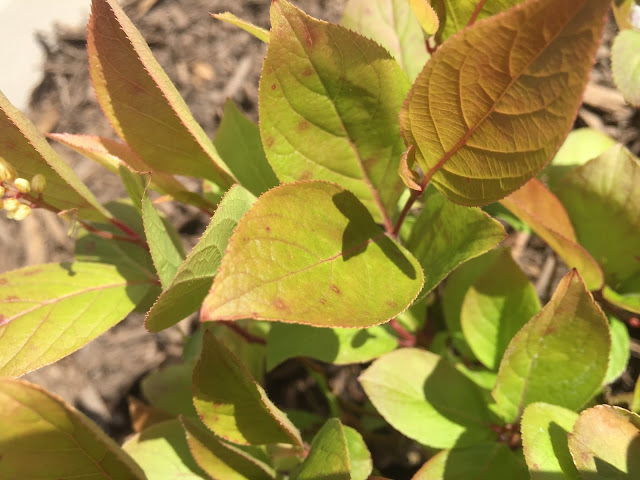 Little Henry is a full sun to part/moderate shade shrub, so maybe after being in the mail going to direct south facing sun is just giving it a little sun burn until it can adjust to the new light conditions? Not sure if this would be over or under watering, but watering is probably my most common way of messing things up so far. I read that these can tolerate pretty moist soils, and I have resisted the urge to go water them since we have been getting showers on a consistent weekly basis - but maybe they don't like to dry out at all when they're first planted? It's new to me! Who knows, maybe they just bronze up a bit in the full sun and that's okay? Now that I look at the two photos back to back it looks like it is certainly plumping up and putting on some new leaves.